Piedmont Technical College and Edgefield Emergency Medical Services will be partnering to offer the emergency medical technician certificate at the Edgefield Count EMS Station One. 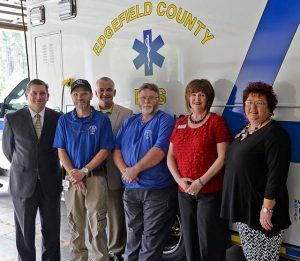 Pictured are, from left, Dr. Jack Bagwell, PTC vice president for academic affairs; Raymond Batchelor, director of Edgefield EMS; Rusty Denning, PTC associate vice president for Continuing Education; Michael Butler, Edgefield EMS training officer and instructor; Deborah Hoffman, PTC continuing education program manager for health and safety; and Vickie Baldwin, Edgefield liaison for PTC Continuing Education. People’s lives often depend on the quick reaction and competent care of emergency medical technicians (EMTs). Piedmont Technical College has been providing education to prepare students in Greenwood to become certified EMTs. Beginning spring 2016, PTC will offer an EMT curriculum in Edgefield County that will lead to a certificate. The EMT certificate will be offered at the Edgefield County EMS Station One. Both Piedmont Tech and Edgefield EMS saw a need for this course to assist not only students in Edgefield County, but also McCormick and Saluda counties. As part of the partnership, Edgefield EMS will be providing the necessary equipment and space to teach the EMT courses. Classes will be offered in the evenings on variable days. The course is being offered as a continuing education course as well as an academic credit course. Those enrolled in the academic portion are eligible for financial aid. Students from either approach who successfully complete the coursework and clinical hours will be eligible to take the National Registry certifying examination. To enroll in the course, students must be 18 years of age, have no felony convictions, have appropriate placement scores, initiate a hepatitis B series by the first day of class and have the ability to lift 125 lbs. For more information on the EMT course, contact Deborah Hoffman at (864) 941-8426 or at hoffman.d@ptc.edu.